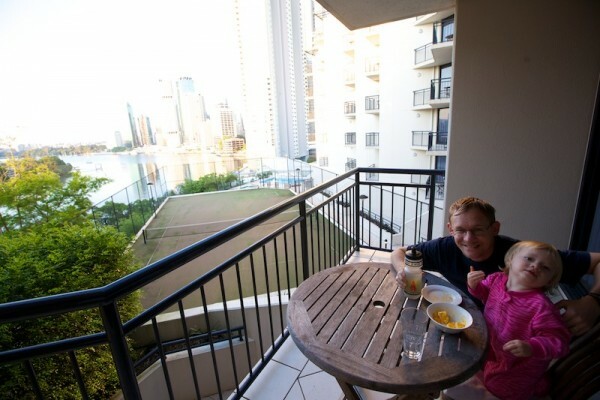 The 6 days before Ayers Rock, we were in Brisbane for a work-related conference for Daniel. Learning from Mom and Sher's experience, this time to the airport we opted to take a taxi instead of the train. Obnoxiously enough, it probably cost the same amount to take a taxi and got us there in half the time and with much less hassle. I highly recommend anyone arriving at or departing from the Sydney airport to choose a taxi over the train - it is worth it! 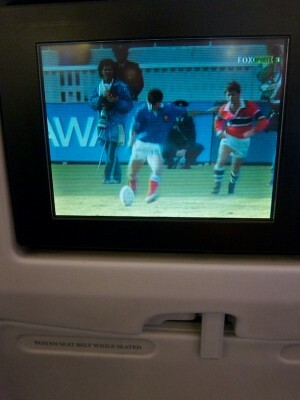 Enjoying the Rugby World Cup on the flight. 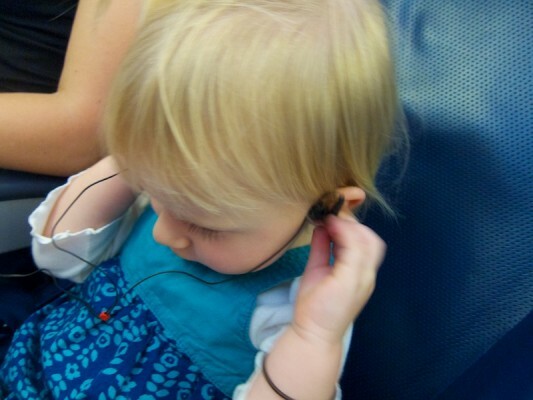 Naomi really wanted to try the airline earbuds on. We didn't even have them plugged in but she didn't care - she loved "using" them! 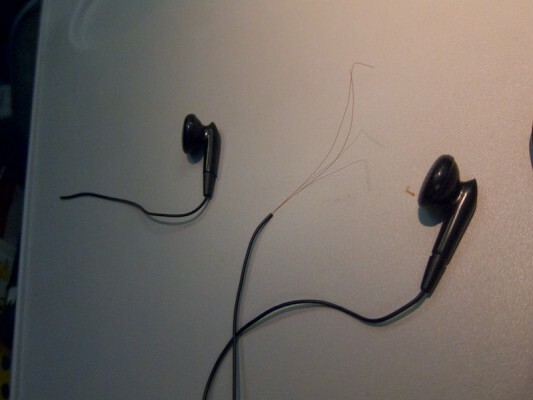 Aaaaand this is why you let your toddler play with the cheap airline earbuds rather than your own expensive earbuds. Because she will somehow manage to destroy them. 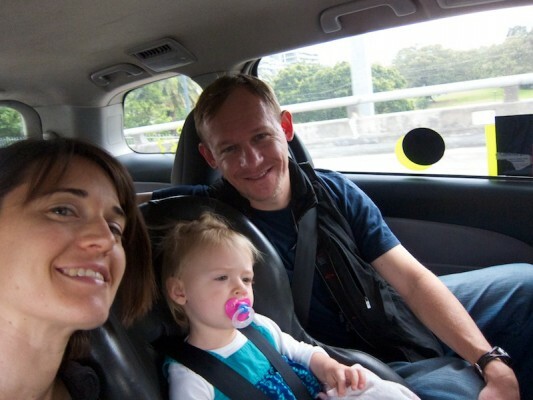 We arrived in Brisbane and drove around in our rental car awhile as Naomi napped in the car. We drove across the major bridge in Brisbane, the Story Bridge. It was neat, although of course a lot smaller than Sydney’s Harbour Bridge. I found out later that they actually have an unusually high suicide rate there because the bridge is not very well-protected against people jumping off it. The railing along the pedestrian walkway is high enough, but the railing along the motorway is below the waist, and so a lot of people just stop their cars, get out and jump. So tragic. But also kind of confusing to me, when it seems they could quite easily string up some nets between the motorway rail and the edge of the pedestrian walkway (only a distance of a few feet), which might at least discourage people or slow them down enough to get some help up there in time. 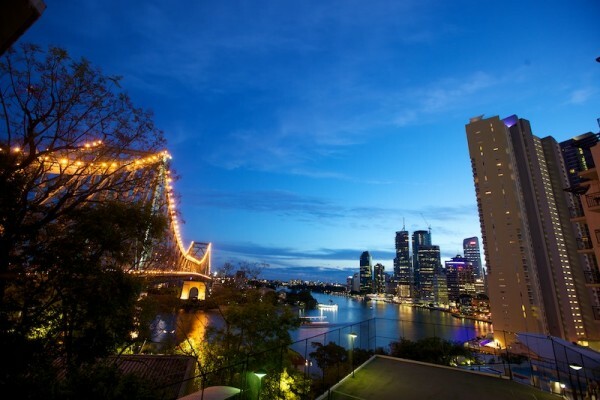 We got to our hotel, which had a really nice view of the Brisbane River, Story Bridge and the CBD (Central Business District). So anyway, on to what we did in Brisbane. Alright, I have to be honest. This was not our most fun trip, so I will probably skip the majority of the time in Brisbane and just mention the highlights for you, because you probably don’t want to read details of a 4-day stretch of me pulling my hair out in a non-babyproofed hotel room with no toys, no transportation, and no places to walk to with a toddler, while it poured rain outside. So instead, I’ll just put up a few pictures of the one afternoon out of the four which contains my best attempt at a good attitude, and then get on to our final day in Brisbane, which actually was a ton of fun. After one day of mostly staying inside the hotel, I braved going out with Naomi. I wasn’t sure where we were going, but it had to be better than that hotel room. I look like I'm having fun, right? Tricked you! I am not. I'm trying to fake it for my child, who actually IS having fun. And thrilled about her jacaranda blossom. I'm actually really peeved at the fact that it's STILL raining and that I only have a raincoat instead of an umbrella because I'm getting all wet. And that made me feel like I could really afford to try a bit harder to have a better attitude. If they could zip around and have fun, I could try to enjoy the day a bit more. And, if nothing else, at least I wasn’t out in that icy water! We stayed here for the next half hour, playing. And I’m not kidding, the area you can see in this photo was IT. It was a teeny-tiny corner of landscaping beside a big university lecture hall. Right next to a side road, which proved difficult when cars zipped in and out and Naomi thought it was fun to dart out into the road. But this was still better than the hotel room. And thank goodness Naomi was desperate enough to actually find this area fun for a little while. And, apart from a few rainy dips in the outdoor jacuzzi, that was the extent of our “outside” time for a few days. Oh except two other times. One morning we visited Daniel’s conference with him for a little while. This was pretty fun. 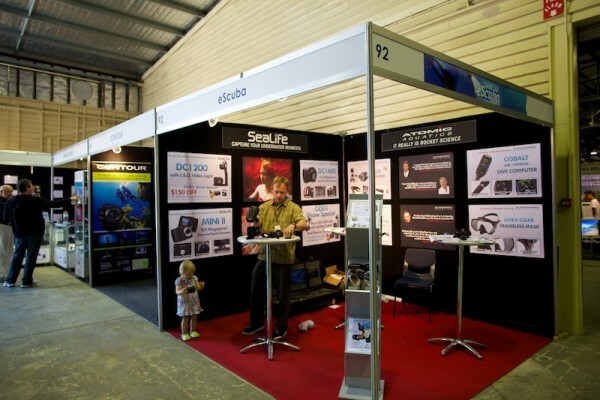 Daniel at the eScuba booth, displaying their underwater cameras. 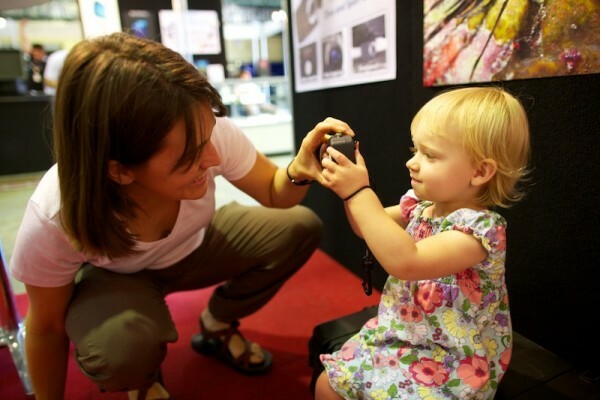 Naomi got to play with one of the underwater cameras on display. I was nervous despite Daniel's belief that she couldn't hurt it. Then I saw a photo of the camera being run over by a car (and surviving unscathed), and realized she probably couldn't hurt it. Much. 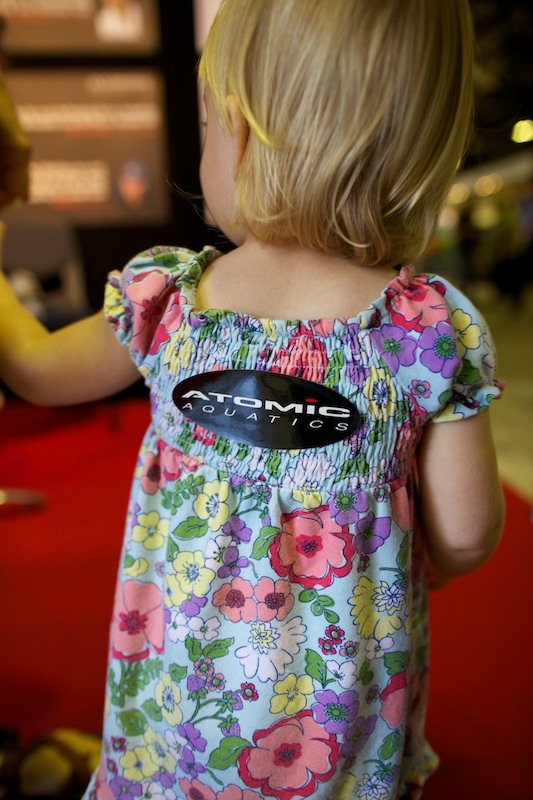 Since Naomi was very popular in our brief time at the conference, her love of stickers was capitalized upon for a little free advertising for Daniel's company's product. 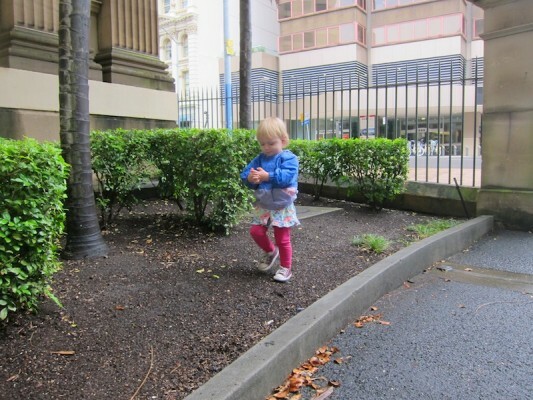 The other time during our first 4 days in Brisbane when Naomi and I got out of the hotel was not so fun, at least for me (Naomi had fun). On Sunday it stopped raining, so I actually attempted to take the ferry to a park a few miles away. I ran the half-mile to the ferry landing pushing the stroller, hoping I could make the next ferry, only to learn that the ticket counter took cash only so I had to run the half-mile back (up a horrendous hill – what is it with Australian cities and insane hills? ), get my cash, run the half-mile again, and proceeded to pee my pants (don’t ask). Nice, huh? Then I got on the ferry and found that the lady taking the money couldn’t break a fifty and I needed something smaller. I about cried. Seeing the look on my face, she said she’d just let me ride for free, but that I’d have to find some change for my return trip later. Then before I got off she sort of hesitantly asked me if I’d been swimming. I said no, and she pointed to my pants which on closer inspection VERY clearly showed what had happened. Of course, knowing that my dilemma was obvious to everyone just, you know, made everything that much more special. Despite this, I played on the playground for another hour or so with Naomi, because there was no way I was going to deprive her of some actual playground time when the poor thing had been cooped up for 3 days. (Besides, no one there will really remember me later… unless I do something stupid like blog about it, right?) So I got nice awkward stares from the other parents, and had one of the most humiliating days I can remember. 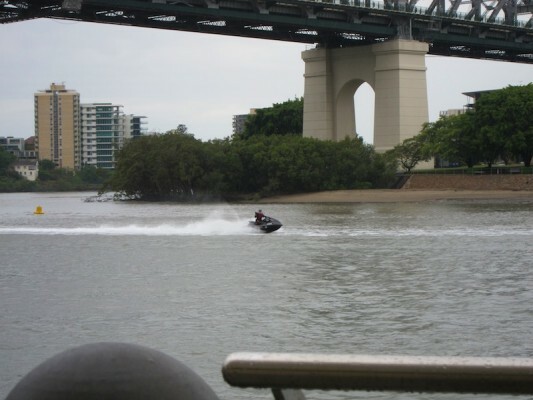 So I realize I’m sort of biased when I say I won’t remember Brisbane very fondly. It’s not exactly Brisbane’s fault, it’s just … what happened. That said, our final day in Brisbane was really spectacularly good. More about that in the next post. First of all I have to tell you that the life of a mom who has delivered a happy healthy baby, unfortunately is doomed to have the “peed my pants” days. A healthy sneeze, too much laughter, a quick jaunt in the park, and sometimes just jumping up and down for joy with your toddler. Here are a few helpful fibs for moments such as these: I sat on a wet bench, The lid popped off the sippy, The baby’s diaper leaked, I spilled my drink in my lap, etc. They come in handy…as does a thin long sleeve shirt packed in the diaper bag to tie around the waste at a moments notice (preferably the lightest thinnest largest one possible, so as not to bulk up the bag, but still provide plenty of coverage or an alternative is a lightweight pair of extra shorts). A quick entertainment idea to throw your way is to get a couple of film canisters or plastic eggs or something like that and fill them partway with rice or bird seed. They make fabulously light noise that toddlers rarely tire of and by making a couple with different amounts of rice in them or different items in them, they will create different sounds and keep the kiddos busy in times of need. Just make sure you tape or glue them shut so you don’t have a mess to clean up as well. ;o) Paper lunch bags/socks and crayons/markers also make for quick hand puppets that are light to carry and quick to pull out for entertainment as well. Hope some of these help you out. I know how it is to be somewhere that has no kid friendly place to be and nothing to do. Pretty soon you’ll be playing I spy and the “run-jump game” to keep her busy. BTW the “run-jump game” is where you call out actions for her to do like: walk backwards down the hall, jump 3 times, do a forward roll, touch your toes, your nose, your belly button, etc. until they tucker out. My kids love that. Looking forward to reading part 2 and hearing about the adorable Koala! Take care! What a riot. Isn’t it amazing what desperation can make you do? True confession from someone who spent my younger years thinking, as I’ve watched other desperate moms, like: “oh, please – can’t you at least . . .” Or, “I’m so glad my child doesn’t do that . . .” Then i find myself in circumstances like this, and say, “I get it.” It’s times like you are having right now that give me such empathy for other moms. The farther down the road of life I travel, the more grace I give others. Hang in there, honey, you’re almost at the finish line of this adventure, and you are a GREAT mom. And you probably will look back and laugh. Love you. Karl peed his pants one time coming back from the playground. He was coming in the back gate which is kinda tricky to get into and when you’re hopping and giggling and trying to get to the can as quick as you can you’re not as co-ordinated as you might otherwise be. Anyway he ended up kicking in the gate, breaking it 2 pieces and peed his pants anyway. Umm. Wow, Diane. Thanks for the story. I love your story, too, Katie. 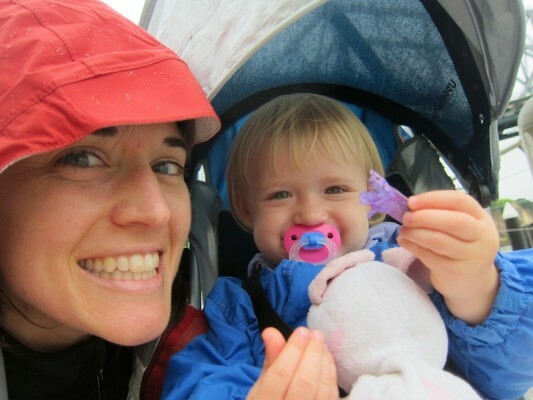 How frustrating for outdoor enthusiasts like you 2 to be stuck in a rainy town for 4 days. I’ve been there, except usually in warm rain, at least.